TNT Racers was a solid WiiWare title that was released in April 2012 in North America so how does this Nitro Machines Edition stack up? Find out in our review! 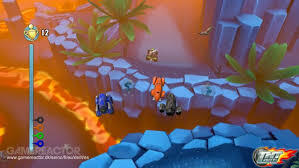 The object of TNT Racers is to force your competition off the screen or destroy them by using power-ups in a variety of different modes including knockout, timed knockout, shadow races, etc. 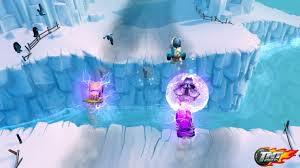 Each mode has unique gameplay mechanics, but for the most part the object is destroy or be destroyed! The Gamepad is required for single player races and sadly the controls do feel a little wonky which makes progressing in the campaign very difficult, but it's not bad enough to call the controls broken, they just could have been better. The game features a fair amount of content and should keep you entertained for awhile! The local multiplayer is where this game really shines however, and if you have friends to play this game with do so as it is seriously fun! The graphics in TNT Racers: Nitro Machines Edition have the same cell-shaded cartoon look of the WiiWare version of the game, but the lighting and effects have a fairly impressive HD look that really makes the game look much better than the previous title on the WiiWare service. The music is fairly good in this title, but the sound effects can get repetitive after awhile, but all and all the game does a good job in the sound department! 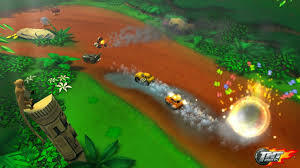 With fun gameplay, excellent local multiplayer and sweet cell-shaded graphics TNT Racers: Nitro Machines Edition is a good racing title for the Wii U eshop, however wonky controls do hinder the enjoyability of the game. Still we recommend this title for those of you who are looking for a fun multiplayer title available on the Wii U eshop! Um...thank you for the multiplayer matches @Rukiafan I had so much fun! If you wanna have some fun with your friends this game is a really good choice. ^ It's a shame the online multiplayer was omitted from this sequel. @Nintenbro hopefully it'll be added in a software update lol? Yeah it's a shame that there isn't any online multiplayer in the game. I did not like this game, but I think that the score is just about right since I'm sure there are people who would really enjoy the game it just wasn't my cup of tea. I'll take a kart racer like Mario Kart or Crash Tag Team Racing over this game any day of the week, but I wouldn't say that the game is awful it just isn't a game that can keep you entertained for hours at a time. Another sweet review from Rukiafan! This game would be better as a purely racing title instead of a destruction derby knockout game. I thought it would be a good place for the Wii U - WiiWare Side-by-side comparison on TNT Racers here. Well, I really like this game. You get pretty good content for such a low price. But don't expect a Wii U experience. It's old school, and it has very basic graphics, but it makes up for it with a great sense of speed and is totally awesome with 4 friends that are into racing games as well. Despite it's simple controls it starts getting really deep once you master drifting, getting a rush throughout the highspeed classes and learn to put plenty of cool items to your advantage. In the times of SNES and N64 this game would have been a classic. Me and my bros agree that apart from very minor issues (soundtrack, camera sometimes, small bugs, no online multiplayer) this is a very fun game.